At Promontory in 1869, bystanders commented that the Central Pacific locomotive Jupiter No. 60 had an “appropriate name” for the ceremonies being completed that day. Indeed - it seemed as if the great Roman god had personally bestowed allegorical blessings upon the great work. Locomotive names were a surprisingly important aspect of early railroads, but not every railroad used them. Facing Jupiter that day was Union Pacific No. 119, a simple numbered engine on a system that had dispensed with the bother of engine names very early on. This practical if unromantic system would ultimately become standard in the United States, especially as railroad systems grew in size and scale. The Union Pacific’s first dozen or so engines did carry names, at first honoring military heroes, beginning with Major General Sherman No. 1, and then geography, like the Idaho No. 8. One of these engines, the Vice Admiral Farragut No. 5, built by Norris Lancaster in Pennsylvania, included a miniature painting of Farragut’s flagship, the USS Hartford, steaming across the sandbox. The UP stopped naming engines around 1866, when Isaac Congdon began to look after UP motive power. There was a lot of work ahead and naming engines were the least of their worries. The Central Pacific took a different approach, and named all of its engines up to the summer of 1869, about 165 in total. Its management wisely avoided naming engines for people (mostly), and focused instead on benign things like rivers, regions, roman gods, animals and concepts, such as Success No. 156 and Excelsior No. 157, built in the spring of 1869 when the CP was on the final stretch to Promontory and the project was an assured success. Engines named for geography included the Auburn, Utah, Mono, and Nevada, while a series named for rivers included the Truckee, Carson, Stanislaus and Tuolumne, even a more exotic river, the Amazon. Engines named for oceans included Atlantic, Pacific, and the Arctic. The Arctic was actually named twice. The first Arctic was a powerful Mason ten wheeler, which CP management renamed for Senator John Conness while it was being delivered to California. Upon arrival, Sacramento shop crews quickly removed the name “Arctic" from the tender sides (putting the road initials "C. R. R. R." on the tender sides instead) and put the name “Conness," flanked by stars, on the cab panels. A second Arctic, this time a 4-4-0 and numbered 11, was ordered from Mason a few months later to replace the first. Only a handful of engines were named after contemporary people. Two were named for CP associates, the Governor Stanford No. 1 and CP Huntington No. 3, while TD Judah No. 4 was named for the civil engineer who surveyed the line. The famous Conness No. 6 followed after that, and then the military figures, Phil Sheridan No. 80 and US Grant No. 81, in early 1868. Conceptual “power” names included Colossus, Tip Top, Champion, Majestic, Giant and Terrible, all of which invoked the huge capacity of the railroad and the engine itself. “Speed” or "motion" names included a series of Rogers-built engines named Rambler, Rusher, Rover, Racer, Pacer, Courser and Stager, the last named after the swift stage horses the locomotive was replacing. Several engines named for Greek and Roman gods. This included Jupiter as well as Pluto, Saturn, Mars, and Apollo, with legendary figures such as Hercules and Ajax. A pair of powerful side tank engines were named Samson and Goliah, and one engine was even named Gladiator. Four Schenectady locomotives were named after legendary women: Juno, a consort of Jupiter; Diana, goddess of the hunt; Eureka, a symbol of California, and Sultana, whose name evoked the riches of the far east, which the Pacific Railroad would open up, at least in theory. Animal names included a series named for birds, like the Ostrich, Heron and Magpie, and a series of eagle names, which included Golden eagle, Bald eagle, Red eagle and so forth. A similar series of themed names included the "Fox" series of Black Fox, Grey Fox, Yellow Fox and so forth. Names were typically placed on the cab panels, and Schenectady and Mason put the engine name on the side of the tender as well, as photographs of Jupiter show. A group of Rogers ten wheelers named Buffalo, Mountaineer, White Bear, Gorilla and Tempest also featured landscape paintings on the tenders, representing the engine names. 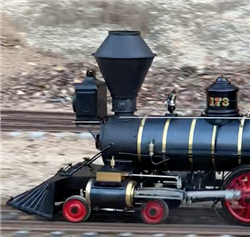 It is impressive to think of miniature gorillas and polar bears painted on engines running along the Sierras, but but in 1868 it was all in a day’s work. The Central Pacific stopped naming new engines in the summer of 1869, and under the direction of Andrew Jackson Stevens, began to remove all names from engines shortly after that. The process was gradual, mainly as engines were shopped in their regular work. Impressively, people remembered the names for some years after they were gone from the cab sides, and it wasn’t unusual to hear people talk about engines like the famous No. 149 by its original name, the Black Fox, while hauling a special train at record speed across the CP main line. The Gov. Stanford and CP Huntington never lost their names at all, and kept them their entire working lives. Impressively, they still have them today, while occupying places of honor at the California State Railroad Museum in Sacramento. A Year Out, What Can We Do?